The lens is changed to 30° down and the cautery hook is on the right and long tip forceps on the left. Determining the junction between the prostate and the bladder requires experience and is probably one of the most challenging aspects of this technique. FIGURE 2 ■ Port placement. 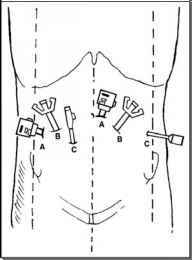 Six ports are placed; 2 to 10/12 mm ports (A), the periumbilical port is for the camera, 2 to 8 mm robotic ports (B), and 2 to 5 mm assistant ports (C). Transperitoneal view. The bladder is reflected by incising the peritoneum just lateral to the medial umbilical ligament, dividing the vas deferens (arrowhead) and continuing the dissection across the midline and dividing the urachus (incision marked by dotted line). Care is taken not to injure the spermatic (arrow) or external iliac vessels. 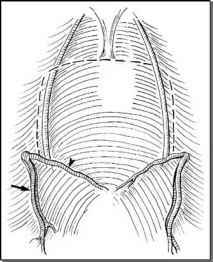 dissection is angled slightly inferiorly and joined at the midline. If the surgeon is in the proper plane, the bleeding should be minimal. Once the anterior bladder is entered, the catheter balloon is deflated, and the second assistant uses the catheter to provide anterior traction. After the bladder is entered, the surgeon should visualize the ureteral orifices and assess for prominent prostatic lobes. If a prominent prostatic lobe is present, the mucosa over the adenoma is incised and dissected off the underlying adenoma. The posterior bladder neck is divided, and the plane between the prostate and bladder is developed inferiorly and laterally. After the bladder neck dissection is performed, the bladder neck should be examined. If the bladder neck is excessively large, then bladder neck reconstruction may be performed. We have employed two techniques for bladder neck reconstruction. A figure of eight suture, usually a 2-0 Vicryl (polyglactin), RB-1 needle, may be placed at the lateral aspect of the bladder neck on either side prior to the anastomosis. Alternatively, if after the anastomosis is performed there is a gap anteriorly, a tennis racquet handle may be created.